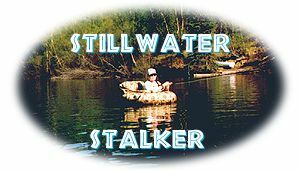 Alaska Flyfishing Online - Alaskan Stillwater Stalker Article Series! Not all of the three million lakes and ponds in Alaska contain sport fish for the angler to pursue. But let's say there is enough stillwater fly-fishing in the state that one angler would never be able to sample it all in one lifetime. Alaska's size is very disproportionate to its road system. And therein lies the rub. How does one access much of the stillwater fly-fishing in the state? Most remote areas are reached by float plane. Some which are a bit closer to civilization might be reached by 4x4 vehicles or RTVs and still others may be along the roadside or a short hike down a trail. The invention of float tubes and more recently one and two man catarafts and kickboats have opened up some new territory for the fly-fisher in Alaska who enjoys pursuing rainbow trout, Arctic char, northern pike, and Arctic grayling in lakes. Up to now the major obstacle when fishing Alaska's stillwaters, besides access, has been its lush foliage. Many lakes have forests and thick brush right to the waterline, and often the lake bottom drops steeply and affords little in the way of walking terrain. But now with this new, lightweight technology a fly angler can significantly increase the number of opportunities available for his/her sport. Not every fishery we cover here will require the need to get out ON the water to fish it. But the angler who does have these modern conveniences, or even a canoe or boat will find greater pleasure in the pursuit of their quarry with no limitations to accessing the prime locations. Since the majority of fly-fishing emphasis in Alaska focusses on salmon and trout fisheries found in the major rivers and streams, the stillwater fly-fisher has many excellent fishing opportunities with little if any competition. And there are some excellent and very enjoyable fisheries even in the large population areas. For those anglers who are just beginning to venture into the sport of fly-fishing, Alaska's lakes can offer many very rewarding experiences where you can hone your skills before tackling some of the more challenging conditions on streams. Traveling fly-fishers should keep in mind that salmon runs are a function of Mother Nature and can be late or early compared to their historical timing dates. The most diligent planning to arrive in Alaska during your peak opportunities can be ruined if the fish don't show on time. Quite often switching to Plan B and focussing on stillwater fishing can provide some very enjoyable memories of fishing in Alaska to take back home compared to a busted vacation. So even if your plans will focus on spin and bait fishing for salmon, be sure to bring along your fly rod just in case. Most anglers think that Alaska's rivers and streams or even the saltwater provides the best fishing in the state. But those in the know realize that Alaska's lakes provide the fly-fisher non-stop action from the time the ice melts until it freezes over again in late fall. The moment the ice opens is the time to grab your rod and enjoy the action long before the river and stream anglers begin connecting.